As I’m out training, every now and then I will come upon a spot that is absolutely perfect and I will think to myself, “This would be a great spot to build a lodge.” Well, Derek Randle beat me to it at the The Retriever Academy. If you are a retriever trainer, either professional or amateur, The Academy is a great place to be able to train and relax because everything you need from technical water, land, lodging, kitchen and kennels is right there. The hospitality and facilities are world class. I can’t think of a better place for the retriever enthusiast to relax, unwind and train in the perfect outdoor setting. If you want a relaxing evening next to the fireplace and plenty of dog talk, stop at The Retriever Academy and spend a night at the bunkhouse. There is plenty of room to work your dogs or take a walk to get the kinks out after a long day of driving. 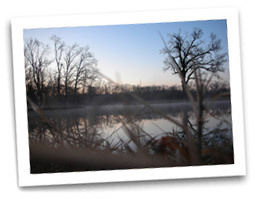 You can watch the deer, turkeys, and ducks or run a water blind. If you’re around Miami, OK, I would recommend giving Derek and Melinda Randle a call and spend a relaxing weekend at the bunkhouse. I was one of the judges for a spring SRS event that was held on the grounds of The Retriever Academy. This place is a retriever trainer’s dream come true. You can tell a lot of planning and work went into the making of the incredible water. As a judge, we were able to use a different piece of the property for each series—that made it great for testing the dogs. And having the lodge on-site was priceless (everything you need is right there). I would recommend The Academy to anyone that is looking for a new place to work your retriever. The facilities at The Academy are second to none. I have stayed there several times on my way to Hunt Tests and enjoyed every minute. From the superb training grounds to the great lodging, you will be hard pressed to find a facility that would come close to matching those of The Retriever Academy. I would highly encourage everyone to try it out...you will not regret it. 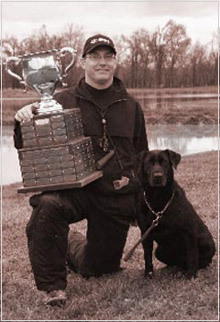 I had the privilege of staying at The Academy during the 2008 Miami, OK, Super Retriever Series event. I have seen some great training/testing grounds in the 8 SRS events I have worked. The Academy is at the top of the list for terrain and setups that will push any retriever to its limits. And after a long day of working the dogs, the living accommodations give you a comfortable place to put your feet up and relax. I look forward to the day I can return to The Retriever Academy. I love places designed for retrievers. The Retriever Academy has literally built a ‘Disneyland‘ for retrievers and their owners. to watch TV or just to relax. I highly recommend training and staying at The Retriever Academy. 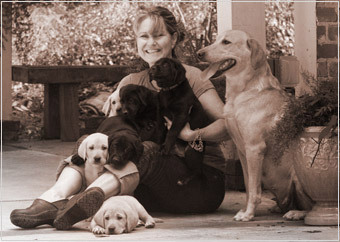 The Retriever Academy is ABSOLUTELY AMAZING, par-excellence, it’s a dog’s ’Disneyland!’ The owners, Derek and Melinda Randle, have created an unmatched, first class retriever training facility that pays lots of attention to detail and offers relaxing and outstanding accommodations for both dogs and their owners. I have had the pleasure to stay at The Retriever Academy a number of times. The first couple of times, I brought the Super Retriever Series crew to stay for a few days each time to work events, and the most recent time I brought a friend and stayed to run a local AKC hunt test. I am impressed every time—from the moment I show up to the time I leave. The apartment in the kennel to the training grounds to the front porch will all make you want to stay for a month or two. Derek has gone out of his way to make me and everyone I have brought with me, feel more than welcome. I really hope I get the opportunity to come back. If there is such thing as a 5 Star Kennel and Lodging, The Academy has figured it out. I have held 3 Super Retriever Events at The Retriever Academy in Miami, OK. Our crew and competitors always jump to the opportunity to come here. The Academy has beautiful retriever-friendly grounds, as well as the lodge that looks right out onto these grounds and the grounds are beautiful. For us, hotels are the norm at most of these events; the crew and I have had the opportunity to stay right here at the lodge. I actually got the pleasure of staying in the home of Derek and Melinda Randle. I have always enjoyed their company and their hospitality when I come. Good times, great conversation, always...This last time I came for a different reason. I brought my pup to Derek for boot camp, I call it boot camp but it is actually basic training. The lodge just happened to be vacant and this time I stayed there. What a pleasurable stay I had. It is so comfortable and cozy. I know how Derek is about detail and it completely shows in every room, but I also found the warm and special touch of Melinda as well. I was only there for about 12 hours and as I drove off I found myself trying to figure out when I could get back and stay again, but longer. Having my pup there will be the best excuse I can have for a while, but believe me I am going to use it. 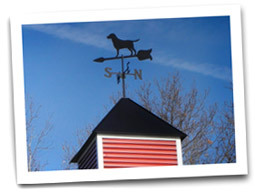 If you have a retriever and love to train and would like to make that mini-vacation, well here is your spot. Miami, Oklahoma. Seriously, you cannot find a better place to hang out with your best canine friend, train on the most beautiful grounds and have the greatest company. 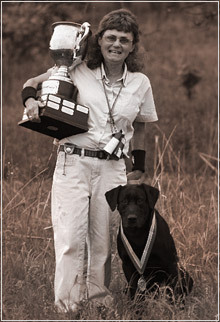 This is truly the beginning of something special in the retriever community and I am proud to have been a visitor and a friend of Derek, Melinda and the entire crew at The Retriever Academy in Miami, OK.
My job as manager of the Avery Sporting Dog division takes me all over the country for everything from club training days to National Championships. Hotels are okay, but any time I have the opportunity to stay elsewhere, I jump at the chance! Alternative lodging on my trips can range from hunting camps and lodges to a private residence every now and then. All of these locations are satisfactory, but there is one place that stands head and shoulders above the rest, The Retriever Academy. A dog campaigners dream, The Academy has a first class kennel, training grounds, and great southern hospitality that will put a smile on your face every time. Walk out on the front porch and you will find more training scenarios than you could run in a week, go back inside to enjoy the camaraderie and amenities of a truly special place. Derek and Melinda are amazing folks that run a tight operation; you can tell that they really care about your experience while staying at The Academy. My dog, Hatchet, and I travel far and wide across the nation and we have made many friends all over. We look forward to every destination, but none more than a trip to the The Retriever Academy. See for yourself and I am sure you will agree. Wow, where do I start? I feel so honored that I have had the opportunity to enjoy Derek’s training grounds. To describe it certainly does not give it justice, but seeing is believing and experiencing its whole aura is infinite notches above the ordinary. 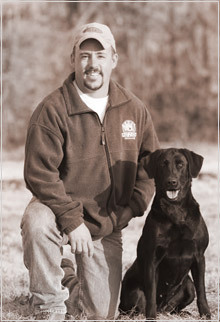 Derek has poured his heart and soul into creating something almost magical for any retriever training enthusiast. Not only can you find an infinite number of ways to train on his grounds, but you are also surrounded by serenity & natural beauty. The Academy has all the facilities you need for a more than comfortable stay, including a front porch where you can sit in the evening and enjoy a refreshment while you watch and listen to the wildlife. We stayed at The Retriever Academy on our way to Texas for our annual duck hunting trip. The only way to describe the whole experience is unbelievable. From the time we arrived, we were treated as though we were part of the family by Derek and his staff. The hospitality was second to none and the training and kennel facility is something I could not have imagined in my wildest dreams. Every aspect of the facility is above first class, and no one- dog trainer, hunter or just someone wanting to get away, will be disappointed with their visit to The Retriever Academy. My only regret is that I can’t get there more often. I made the long drive from Montana to Miami, Oklahoma, to compete in a SRS competition and needed a place to put my dog in the water and to train a bit. I had only briefly met Derek, but decided to give him a call. Derek exemplified true southern hospitality when he invited me to use his grounds. What a beautiful site. His kennels and living quarters for guests are excellent. I only wish The Retriever Academy was closer to Montana. Believe me, Derek’s facilities are top notch, first class. And I thank Derek for his generosity to me. Outstanding, top shelf, first class! I’m trying to find a word that describes my experience at The Retriever Academy. It is the Augusta National of dog training! From the grounds to the lodging to the hospitality everything is first class. My dogs have excelled at a pace they could not have, unless they had the opportunity to train at the Retreat. If you ever have the opportunity to come train and stay at The Retriever Academy you will not be disappointed! I will predict it will be the first among many visits! Thank you so much for inviting us to stay and train at your magnificent facility. We really appreciated all of your hospitality; the staff was so nice and accommodating to us. Therefore we had a wonderful time! The clean groomed training grounds and cozy bunkhouse was like a weekend retreat while still working. After a long day of training, we were sitting on the front porch grilling stakes at sunset watching a herd of deer graze in the front yard. It was such a peaceful setting to say the least. Your training grounds are phenomenal! I would like to give a big thanks to Derek and Melinda Randle and all those who were so gracious to all of us at Four States HRC when we spent the weekend at The Retriever Academy. If I could, I would live there. The lodge was prefect. I could have made it my home. It had all the amenities of home without the stress. Plenty of room, clean comfortable beds and a full size kitchen. I understand now that he has done some remodeling to make it even more enjoyable. This would be just a nice quiet weekend getaway for a couple, or a group to go train on his property. I remember getting up in the morning and walking outside to watch the ducks land in the training ponds and the deer grazing in the pasture. How could it have been any better? The training sessions we had were awesome. We learned so much in two days and the only regret was that we did not have a couple more days to spend. In fact, we are now planning another long weekend that all our club members can attend. I would recommend The Retriever Academy to person or groups that wanted a great training experience. I hope that Three Rivers HRC will be having their hunt test there again this year. Maybe I will be invited to judge. 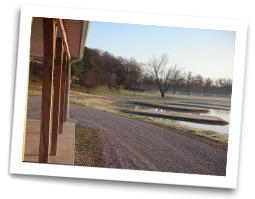 If you are a retriever training enthusiast, you will have a very difficult time finding a more perfect combination of grounds, water, facilities, hospitality and people than The Retriever Academy near Miami, OK. It doesn’t matter whether your interests are hunt tests, field trials, SRS or simply gun doggin’, they have first class accommodations for you. there are accommodations for you to sit down in front of the fireplace and cue up any one of many popular training videos to study up for the next session. Derek and Melinda Randle and their staff are as accommodating and as knowledgeable hosts as you will find anywhere. Simply put…they are just plain good people! I stayed at the The Retriever Academy for a week when I was getting ready for the Spring 2009 HRC Grand. One word: AMAZING! The planning and preparing that has gone into this place is incredible-the training grounds have been meticulously designed and the lodging was extremely comfortable. We were able to get some great training done during the day, then relax in the evenings on the porch with a steak on the grill. I’d recommend this retreat to anyone!!! 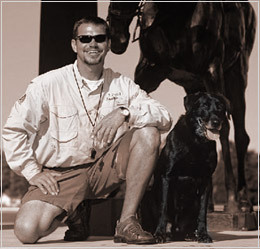 Having stayed in lodges and trained in places all over the southern United States, I cannot say enough how lucky I was to have the opportunity to stay at The Retriever Academy. The lodge is perfect, comfortable, and clean and a great place to hang with the guys or to spend some quality time with the family. The totally indoor kennel facility is second to none. On top of that, all one needs to do is step off the large front porch into the most state-of-the-art training grounds I have ever laid eyes on. 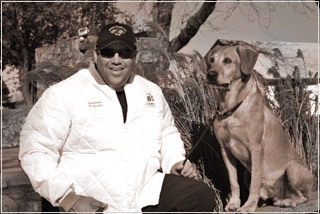 Upon surveying the land, it is immediately evident Derek has put his years of experience in producing world class retrievers to good use in the lay out of this training paradise. In this environment, you and your retriever(s) will both learn things you did not know possible! The six-hour drive from our home to Derek and Melinda Randle’s home and their guest bunkhouse in Miami, Oklahoma, never seems long. We have been making this trek for the past three years. Driving through the “Welcome” gate at The Retriever Academy, our stress seems to disappear as we look across the grounds. The training grounds at The Academy are well maintained and beautiful to the observer. We really enjoy sitting outside of the bunkhouse early in the morning, watching the sunrise, and viewing Derek’s artistic creations of different technical and surge ponds that he has envisioned and developed over the past few years. The guest bunkhouse shows signs of Melinda’s warm, southern hospitality. The well-designed and attractively decorated rooms are immaculate and inviting. Upon entering, we soon realized that the Randle’s had thought of everything we would possibly need by stocking it in the bunkhouse. We feel at ease and comfortable sitting before the fireplace, reading hunting magazines or watching hunting videos on the flat screen television. Thank you, Derek and Melinda, for sharing a little piece of your world with us. As The Retriever Academys’clients, we feel it may not be Heaven, but it’s REAL close! 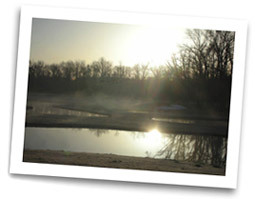 There is nothing more rewarding or exciting than to wake up on a early sunny morning, grab a cup of coffee, step out on the front porch and seeing the mist rise from the training ponds knowing…you are about to enjoy the day training your retriever on some of the finest grounds anywhere. What’s even better is being able to enjoy the camaraderie that retriever training and The Academy inherently brings. I have had the pleasure of meeting a variety of people, all with the common bond of man’s best friend and the love of watching the dogs work. Whether it is water or land, just about any training concept that can be imagined, from basic to advanced, can be taught here. 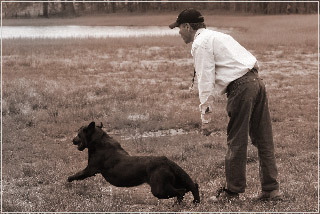 I look forward every year to the opportunity to stay at The Retriever Academy and train on the property. By the way, the human accommodations are top notch too. It’s been my pleasure to have trained, judged and stayed overnite at your fine facility on several occasions living only two hours away. My first impression was “WOW”—how could you develop all this technical water and build such a nice guest house in such a short time? Another part of this equation to consider is the quality of the owner/professional. I have judged you and noticed how well you handle your dogs and how professional you carry yourself before, during and after the competition. The last time my co-judge and I judged you in 2009 you passed 12 of 14 AKC Master Level dogs. This suggest you have a solid training program, spending quality time with each dog and have access to very nice technical water. Why would a Retriever Enthusiast not want to spend quality time at your “state-of-the-art” facility and enjoy working his/her dogs along side a friendly, successful professional trainer? In short, I highly recommend The Retriever Academy and all the good it has to offer. your continued love and enthusiasm towards a loyalty like no other. Contact us for scheduling a stay at our bunkhouse and proper introduction to The Academy.